A good steak is a must at a barbecue. The secret with steak is not to complicate it with excessive and unnecessary flavours. Lay the steaks out flat on a large dish and scatter with some crushed peppercorns. Drizzle with a little olive oil and set aside covered for an hour or two at room temperature. Try not to over agitate the meat whilst it is on the grill, rather instead turning it just once. Slice the bread in half and place on the barbecue to toast lightly. 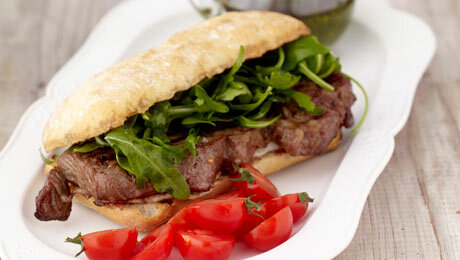 To serve, spread a little Cashel Blue Spread on the toasted ciabatta, and add some rocket leaves. Place the steak on top and season with some salt and pepper.